Your breast form can come in a range of weights and colours. The ideal breast prosthesis will suit your lifestyle and maximise your comfort. For help in choosing the size and shape of your breast form, simply contact us. The Amoena Contact 1S Breast Form adheres securely to your body which gives you a new sense of freedom and self-confidence. The Contact 1S has a standard silicone layer with extra soft film. The sh.. 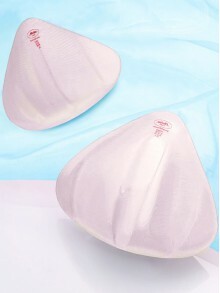 The Amoena Contact 2A Breast Form adheres securely to the body, giving you a new sense of freedom and self-confidence. The Contact 2A prosthesis is made with InTouch Light Silicone which is an impr.. The Amoena Contact 2S Comfort Breast Form adheres securely to the body, giving you a new sense of freedom and self-confidence. The Contact 2S prosthesis has a standard silicone layer with extra sof.. The Amoena Contact 3E Breast Form adheres securely to the body, giving you a new sense of freedom and self-confidence. The Contact 3E prosthesis has a standard silicone layer with extra soft film. .. The Amoena Contact 3S Breast Form adheres securely to the body to give you a new sense of freedom and self-confidence. The Contact 3S prosthesis is made with InTouch Light Silicone which is improve.. The Amoena Energy Cosmetic 3S Breast Form offers a unique pearl surface on the back of the prosthesis which lets air freely flow and increases ventiliation & moisture evaporation. The Energy Co.. The Amoena Natura 3S Breast Form is designed to drape like a natural breast to move with the body which even flattens when lying down. The Natura 3S prosthesis is made with a standard silicone laye.. The Amoena Natura 2S Breast Form is designed to drape like a natural breast so that it moves with the body which even flattens when lying down. The Natura 2S prosthesis is made with a standard sili.. The Amoena Natura 3E Breast Form is designed to drape like a natural breast to move with the body which even flattens when lying down. The Natura 3E prosthesis is made with a standard silicone laye.. The Amoena Natura 3S Light Breast Form is designed to drape like a natural breast so that it moves with the body, even flattening when lying down. The Natura 3S Light prosthesis is made with a stan.. The Active Ocean 1082X Swimform by Anita is a clear silicon reduced prosthesis which is perfect for swimming or for active lifestyles. The water drains through ribbed Channels at the back of t.. The Authentic 1020X Breast Form is noticeably natural. With its outstanding fit and lightness, this prosthesis adapts to every movement and ensures a feeling of authenticity. Key Features .. The Anita Tri-Tex1055X Breast Form has a ribbed design. This prosthesis has a soft, breathable microfibre backing for extra skin-friendliness. Made from 100% Silicone with Microfibre back. Key .. The Anita TriNature Softlite 1051X Breast Form is designed with the patented FlexGap technology which allows the prosthesis to have natural movement. The TriNature Softlite prosthesis is up to 35% ..